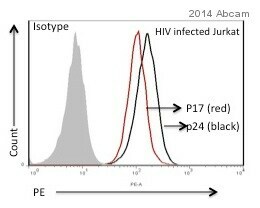 Other Immunogen Type corresponding to HIV1 p17. ab9067 was raised by immunizing BALB/c mice with purified HIV-1 (Strain IIIB) lysate. 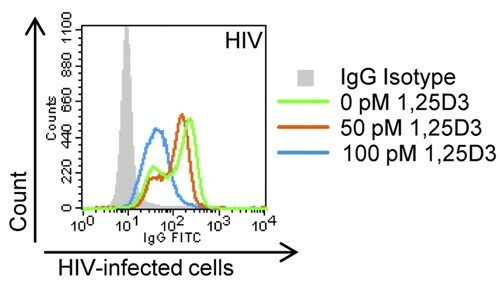 The antibody may be used in indirect immunostaining techniques to detect HIV-1 core protein in fresh or cultured HIV-1 infected cells. Studies on core antigen synthesis and metabolism are performed using Western blotting or radioimmunoprecipitation analysis. The antibody may also be valuable for the affinity isolation of HIV-1 core protein. Purified from serum-free culture supernatant. Our Abpromise guarantee covers the use of ab9067 in the following tested applications. ICC/IF Use a concentration of 1 - 10 µg/ml. HIV1 p17 is the matrix protein of the Gag polyprotein which performs highly complex orchestrated tasks during the assembly, budding, maturation, and infection stages of the viral replication cycle. During viral assembly, the proteins form membrane associations and self-associations that ultimately result in budding of an immature virion from the infected cell. Gag precursors also function during viral assembly to selectively bind and package two plus strands of genomic RNA. ab9067 staining HIV1 p17 (red) in Jurkat cells by Flow Cytometry. Cells were fixed with paraformaldehyde and permeabilized. The sample was incubated with the primary antibody (1/100 in PBS + 10% FBS) for 30 minutes at 4°C. An undiluted phycoerythrin-conjugated goat anti-mouse IgG was used as the secondary antibody. Gating Strategy: Live Cells. Flow Cytometry - Anti-HIV1 p17 antibody [2D11] (ab9067)Image from Campbell GR & Spector SA, PLoS Pathog. 2012 May;8(5):e1002689. Epub 2012 May 10. 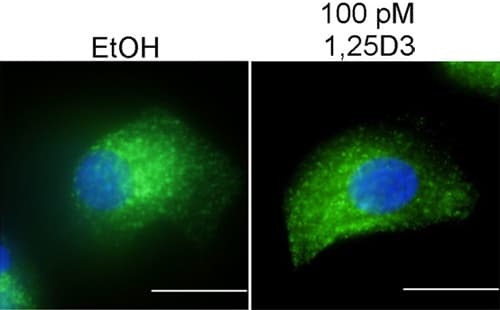 Fig 1.; doi:10.1371/journal.ppat.1002689; May 10, 2012, PLoS Pathog 8(5): e1002689. Flow cytometric analysis of monocyte-derived macrophages infected with HIV, staining HIV1 p17 with ab9067. Cells were treated with 1a,25-dihydroxycholecalciferol (1,25D3) at varying concentrations, before being infected with HIV. Immunocytochemistry/ Immunofluorescence - Anti-HIV1 p17 antibody [2D11] (ab9067)Image from Campbell GR & Spector SA, J Biol Chem. 2011 May 27;286(21):18890-902. Epub 2011 Mar 30. Fig 6.; doi: 10.1074/jbc.M110.206110; May 27, 2011 The Journal of Biological Chemistry, 286, 18890-18902. Immunofluorescence analysis of Macrophages treated with 100 pM 1,25D3 or vehicle control (EtOH) and infected with HIV1Ba-L, staining HIV1 p17 with ab9067. Cells were fixed and permeabilized in PBS supplemented with paraformaldehyde and 0.1% saponin for 30 min. Samples were incubated with primary antibody and an AlexaFluor®488-conjugated goat anti-mouse IgG was used as the secondary antibody. Publishing research using ab9067? Please let us know so that we can cite the reference in this datasheet.